We’re kicking off another new series this week: Start Shooting Better. We’ll be outlining a variety of shooting drills and tests to help you improve your marksmanship. The drill we’re looking at for our first “episode” is Dot Torture. This is one of my favorite drills, but also one of the most difficult that I practice on a regular basis. In the video below, I’m joined by our friend John Johnston to help explain and demonstrate this drill. Scroll on past the embedded video if you’d rather read the transcript instead. CHRIS: Hi guys, I am Chris from Lucky Gunner, here with John Johnston from Citizens Defense Research, also the host of Ballistic Radio. 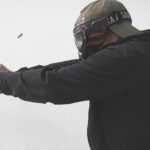 He’s here to help us kick off a series we’re doing outlining some different drills you can use to practice at the range and improve your mechanical shooting ability. 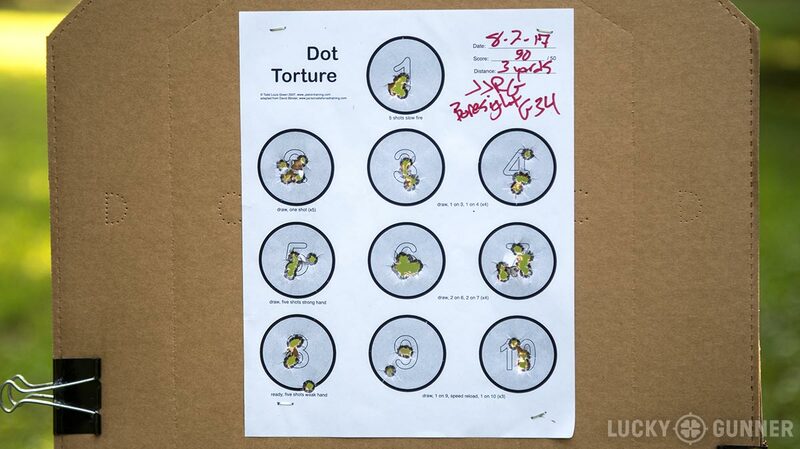 Today we’re going to be talking about the Dot Torture Drill. So John, tell us about Dot Torture. JOHN: So Dot Torture is one of those things where a lot of people confuse what’s going on. Essentially, it’s a 50-round course of fire where you’re aiming at 2-inch circles. I usually start people out at three yards and then you can progress in distance from there. All we’re really working on is mental discipline and focus and trigger control. There are multiple tasks where we draw and fire, we do some strong hand only/weak hand only shooting, shoot at multiple targets, but there’s absolutely no time limit. So really, what you’re learning is how to work the trigger correctly and handle the problem that you’re dealing with at the time. Dot 1: Draw and fire five rounds. Go slowly on this one. The goal is maximum accuracy. Ideally, you want to make one big hole right in the middle of that circle. Dot 2: Draw and fire one round. Repeat that four times for a total of five rounds. Dots 3 & 4: Draw and fire one round at dot 3, then one round at dot 4. Repeat three more times to make four repetitions totalling 8 rounds. Dot 5: Draw, and fire five rounds using the strong hand only. Dots 6 & 7: Draw and fire two rounds at six and two more rounds at seven. Repeat three more times for a total of 16 rounds. Dot 8: Start at a low ready position, and fire five rounds using only the weak hand. Dots 9 & 10: Draw, fire one round on dot nine, perform a speed reload and fire another round on dot ten. Repeat two more times for a total of six rounds. 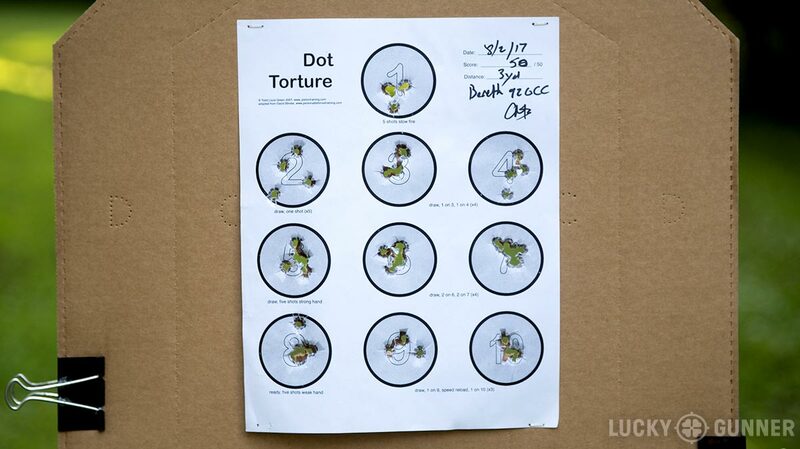 There is an alternate version of the Dot Torture target with modified instructions specifically for Double Action/Single Action pistols. 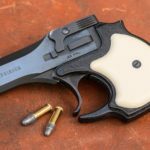 Since this is primarily a trigger control drill, if you’re shooting a traditional double action gun, you want to make sure you get plenty of repetitions with the DA trigger and the double action to single action transition. CHRIS: John, what’s the goal for this test. What score are we shooting for? JOHN: Clean. You want to shoot it clean. I stay at a distance until I am able to consistently shoot it clean and then I back up. CHRIS: So don’t go to four yards until you can get 50/50 at three yards, etc. CHRIS: So the best I’ve done — I think I’ve cleaned it at maybe five or six yards. What’s the best you’ve done? JOHN: I’ve done it at 10 yards… once. And that’s back when I was actually still okay at shooting. I can’t do that now. Usually, I just start out at three yards and just see where I’m at. CHRIS: So there’s no shame in doing it at three yards and camping out there for a while. That’s not atypical at all. JOHN: No, unless it becomes extremely easy for you to do, and then I would move back. There are also some ways to make it slightly more difficult if you want to, but that’s not the intent of the original drill. CHRIS (VOICE OVER): John and I both managed to clean Dot Torture today at three yards. John was shooting his Boresight Solutions custom Glock 34 and I was using my Wilson Combat Beretta 92G Compact Carry. These guns are both relatively easy for us to shoot well and we were taking our time. It took us each about four minutes to run through the drill. 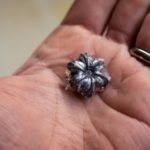 Typically, we would increase the distance to four or five yards to make it more challenging, but we could also shoot it with a smaller gun, or even add some time pressure if we wanted it to be a little harder. I suggest running it without a time limit because it is such a great drill to force you to slow down and find out what you need to work on. So download a target, give it a try, and let us know how you do.